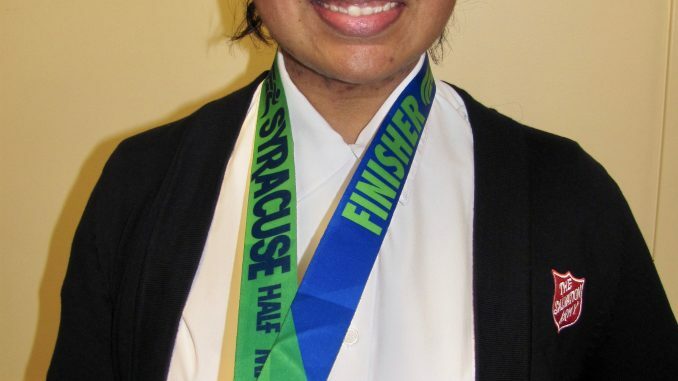 Lieutenant Alberta Rakestraw of Oswego County Salvation Army, wearing the medal she received for running the recent Syracuse Half Marathon in her personal best time of 2 hours, 16 minutes, and 11 seconds. 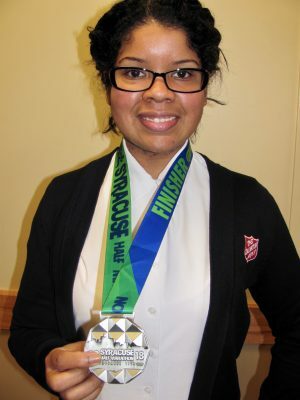 OSWEGO – A new Salvation Army officer, Lieutenant Alberta Rakestraw, began her duties at the Oswego County Corps in July. She got off to a fast start by participating in the recent 7th Syracuse Half Marathon sponsored by Byrne Dairy. She finished the run in 2 hours, 16 minutes, and 11 seconds. It was her personal best time over four half marathons. Her goal for the latest run was 2 hours and 30 minutes. She prepares for each marathon with a 12-week regimen of progressively longer runs. She is also heavily involved in kick boxing four days each week. Lieutenant Rakestraw, a native of Maine, came to Oswego County from her previous posting at Troy. She has also served The Salvation Army in Massachusetts, Pennsylvania and Vancouver. Among the lieutenant’s current duties is organizing the Christmas kettle campaign. The challenge is to raise more than $100,000. The kettles will be out until Christmas Eve. Anyone wanting more information or to offer service as a volunteer may call 315-343-6491 or stop at the office at 73 W. Second St., Oswego, between 10 a.m. and 3 p.m., Monday through Friday.